Quality control is strictly carried out in frontline manufacturing, including product manufacturing, and assembly and testing processes. Therefore, it is essential to have high-precision fixtures and gauges to ensure product quality and verify that they are within a permitted size. Measurements can be considered a foundational part of manufacturing. 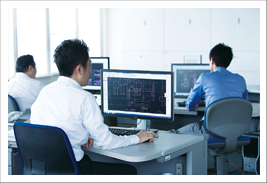 Chuo Koki has a planning division that specializes in fixtures and gauges for testing, enabling us to work with users and deliver a service beginning from advising on made-to-order products, proposing value analysis/ value engineering plans, and extending to production system development. Our information collecting ability and designing know-how have proved useful in product development for streamlining and cost reduction. For example, regarding testing gauges for vehicle parts, we provide high-precision products that deliver safety, productivity, and functionality. We also actively involve ourselves in upgrading technology. Not only do we install 3-D computer aided design systems, we help improve users’ production skills by incorporating the most up-to-date information. Gauges for testing molded products are used for acceptance judgment, and they also play a vital role in verifying the product quality. As a specialist trading company that deals in machine tools, Chuo Koki has extensive knowledge of frontline manufacturing. With this knowledge, we can deal swiftly and effectively with plans for any kind of testing gauge.